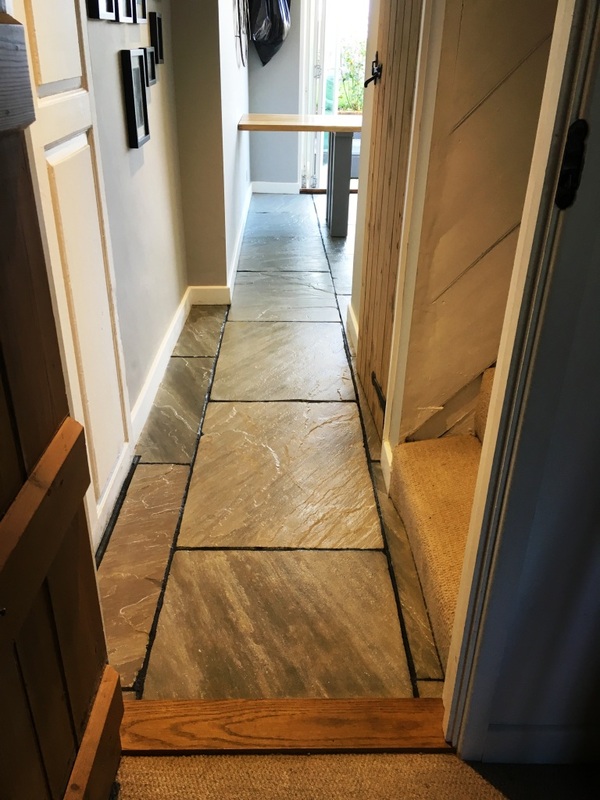 Here’s a job I completed not too long ago in the town of Maldon, which sits alongside the Blackwater estuary in South Essex. 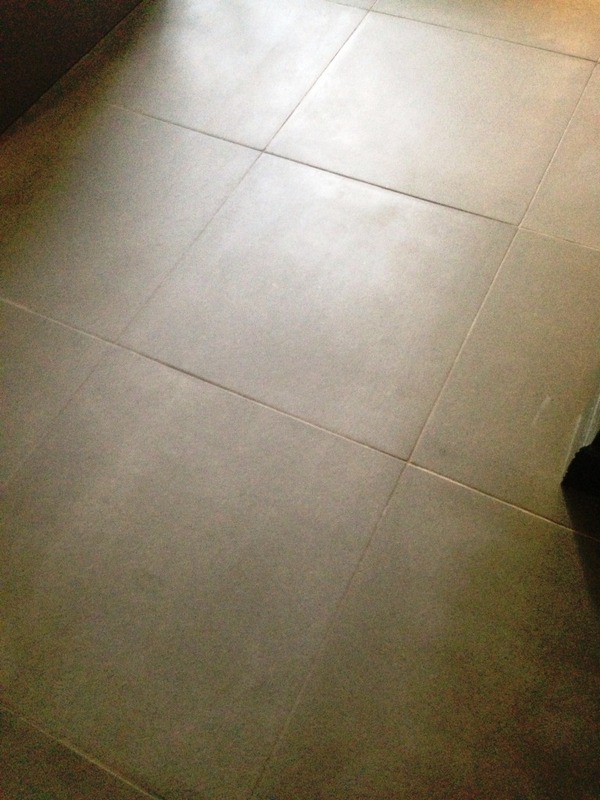 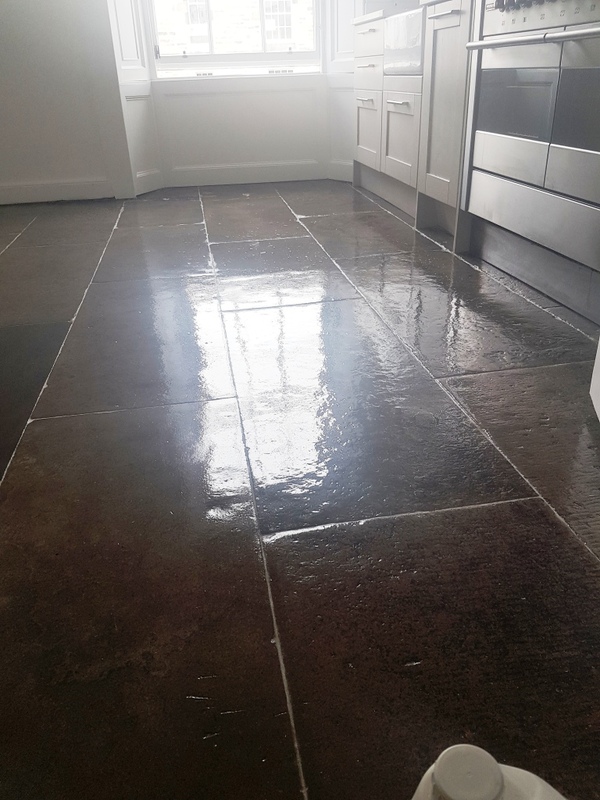 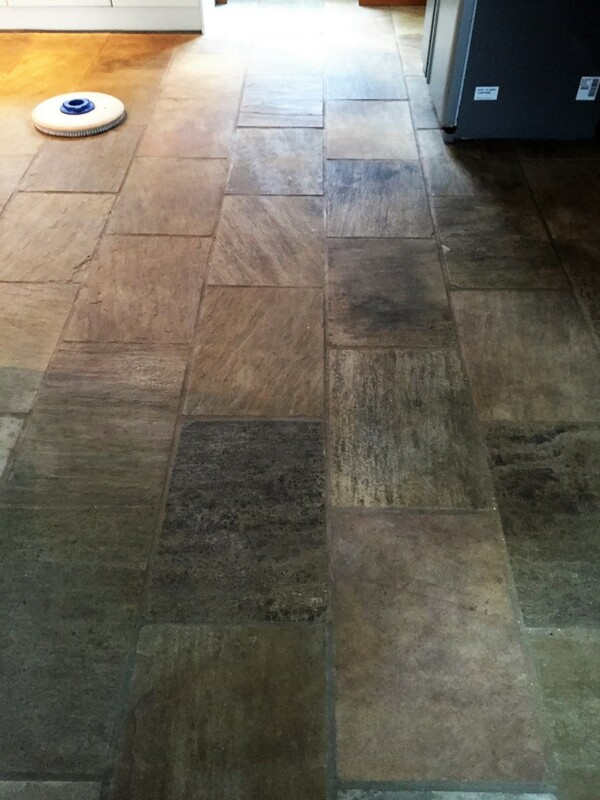 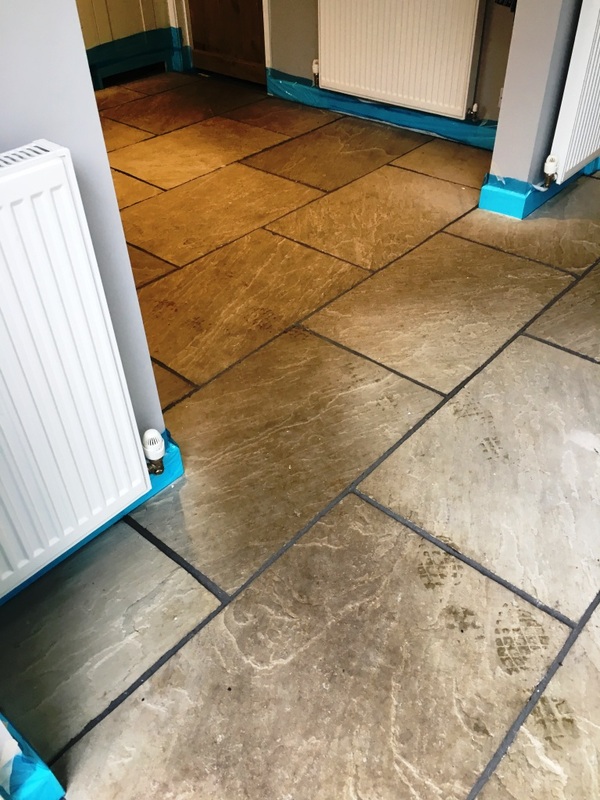 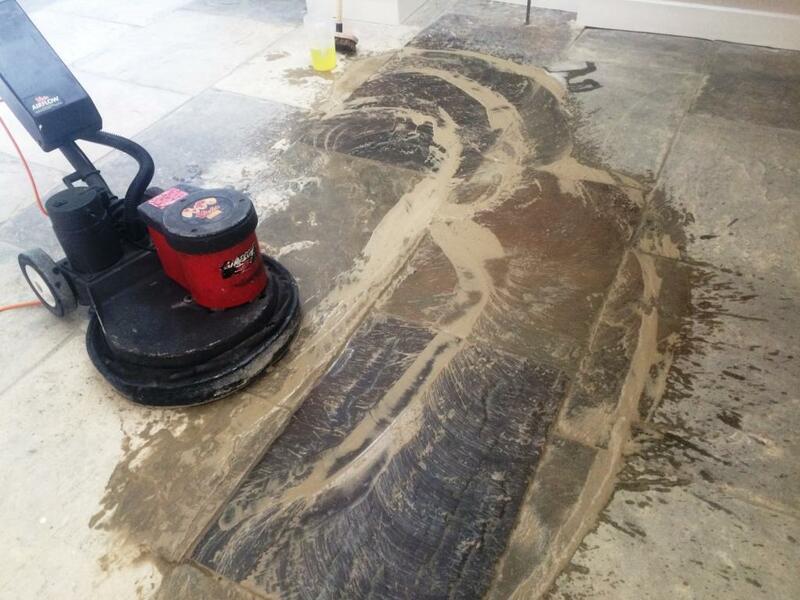 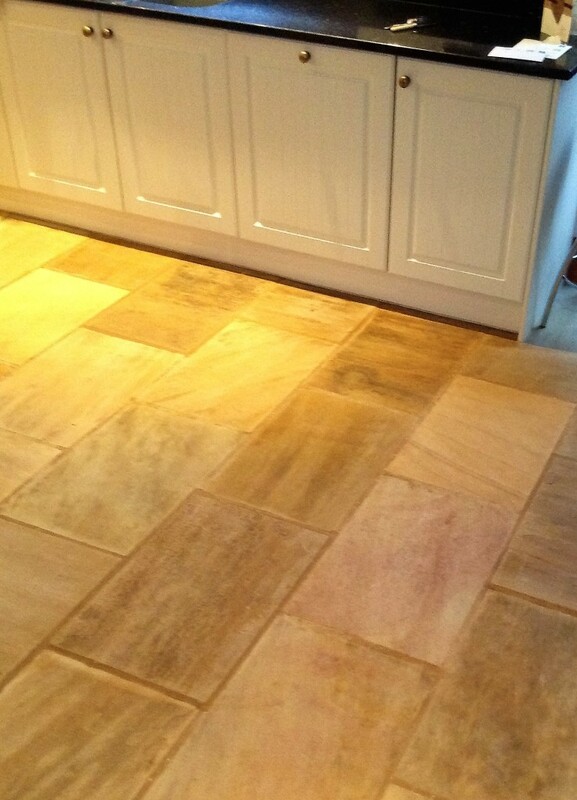 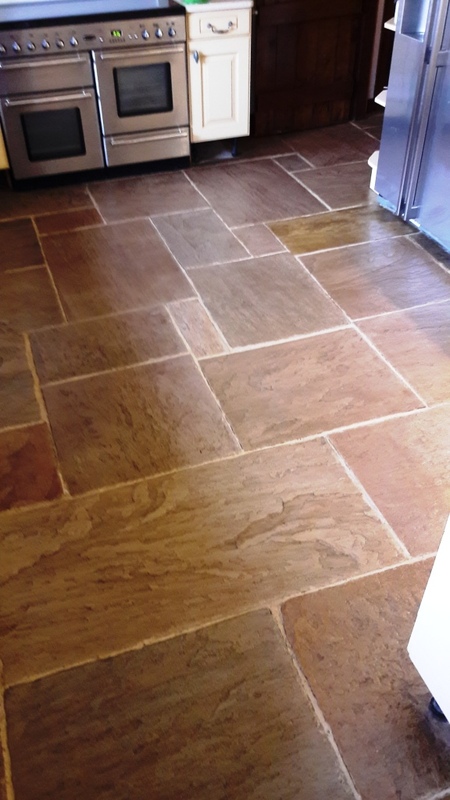 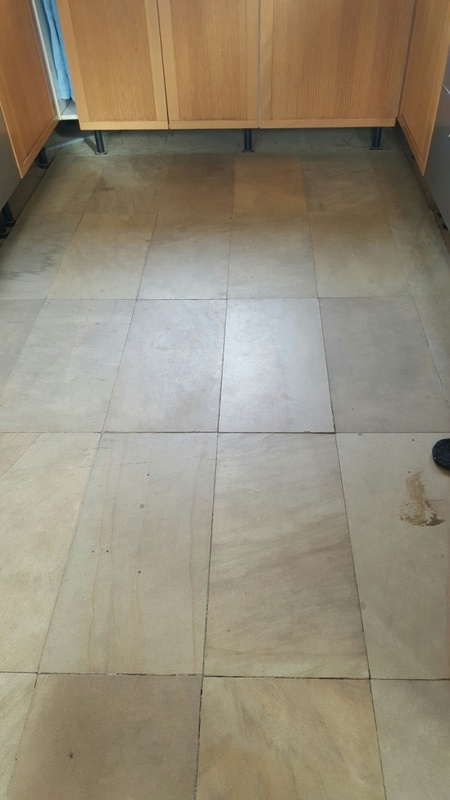 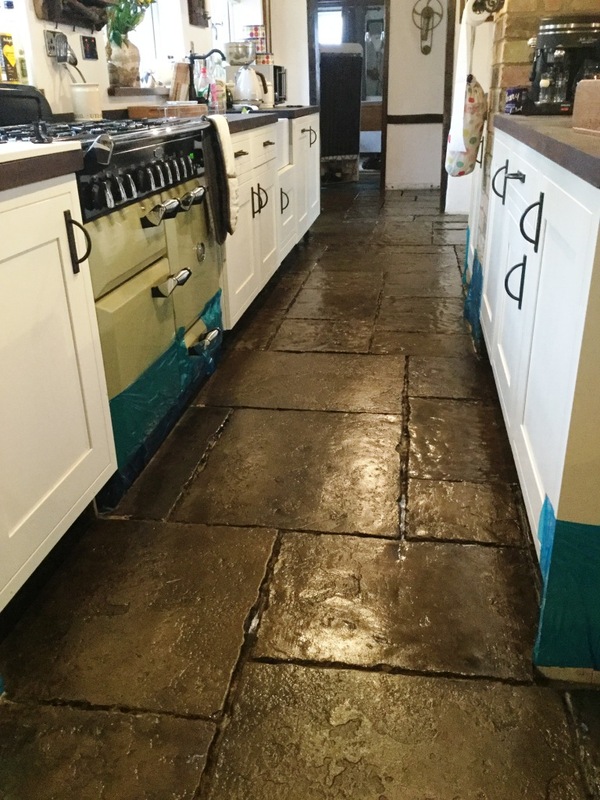 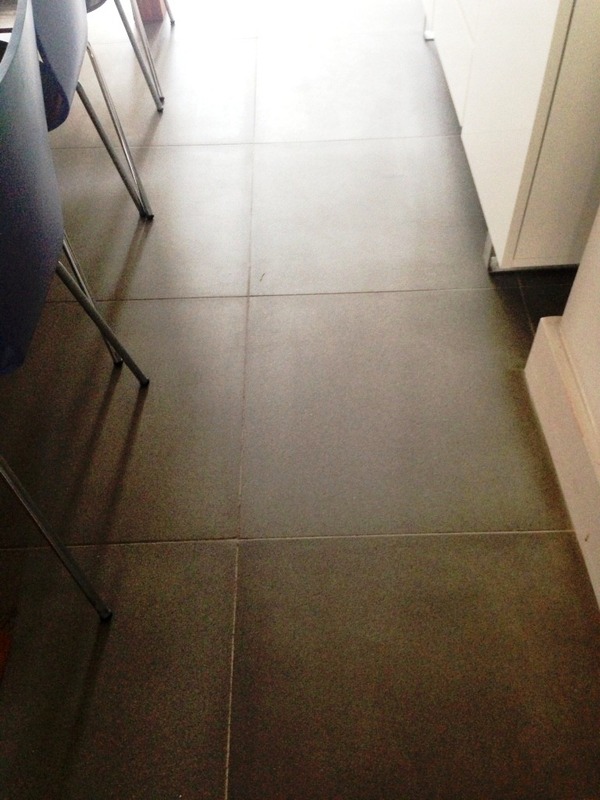 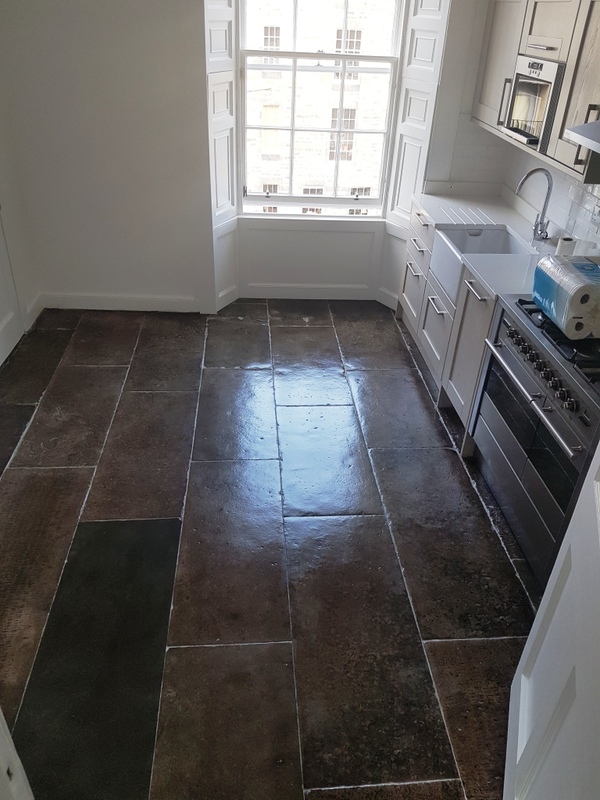 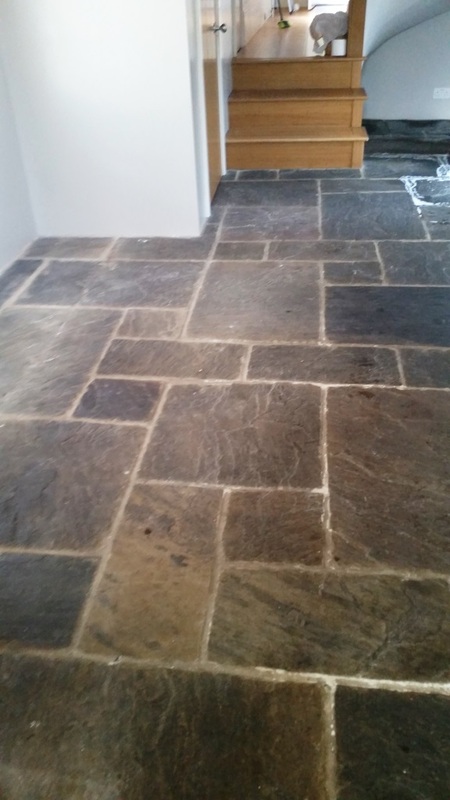 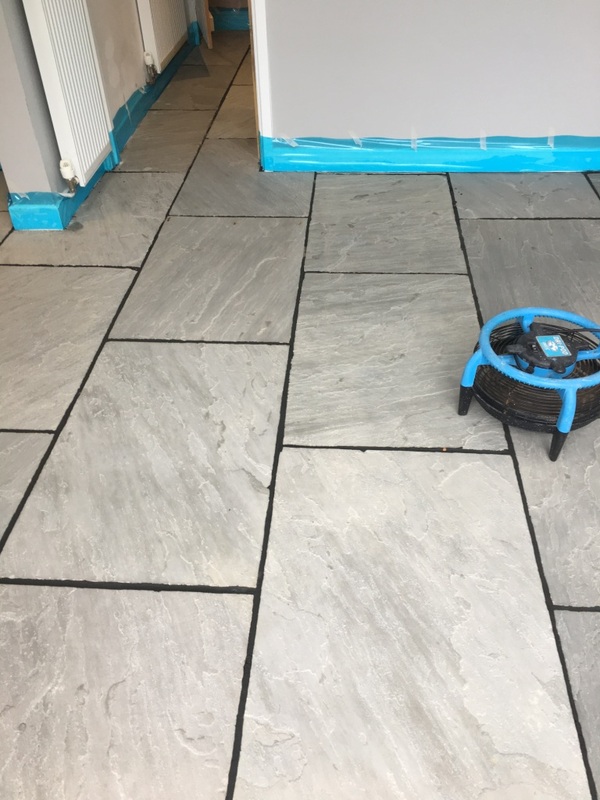 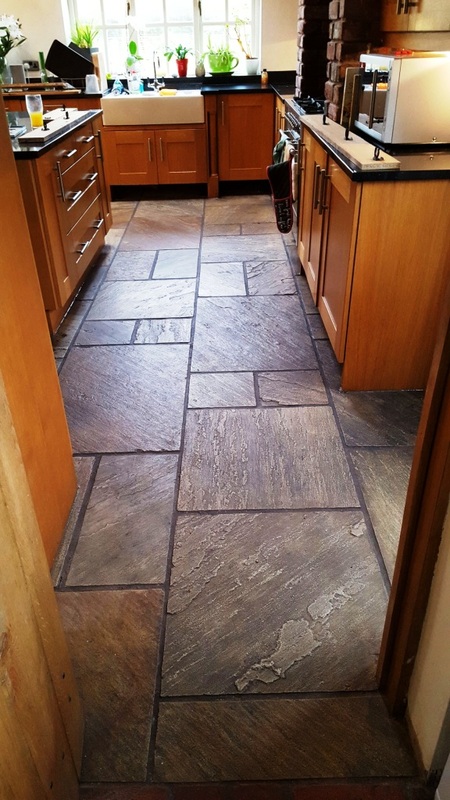 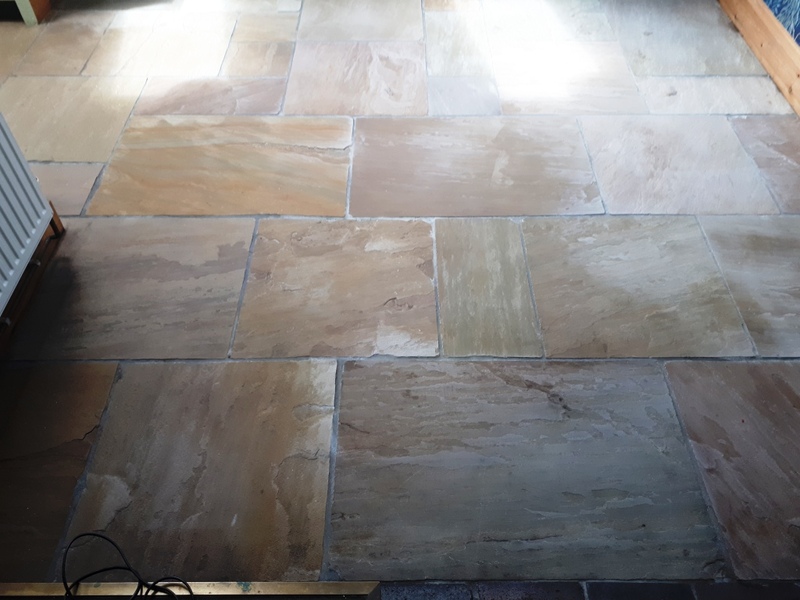 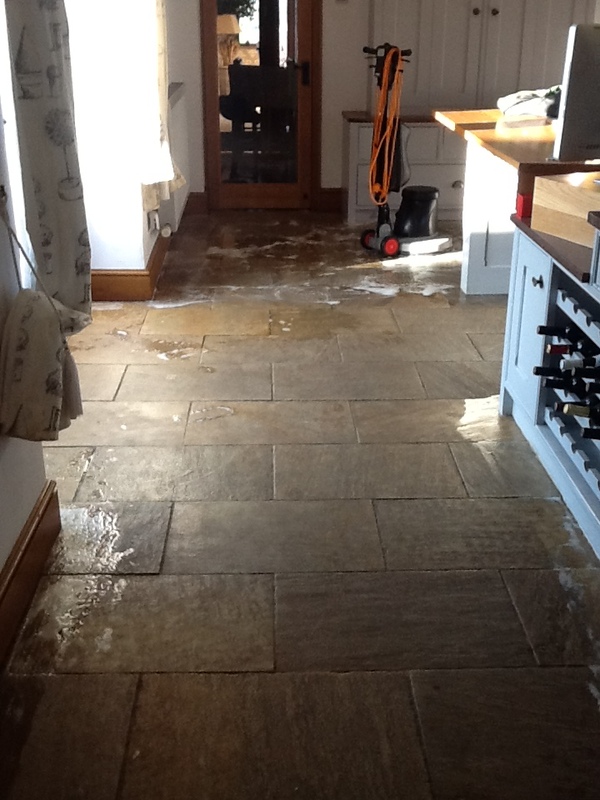 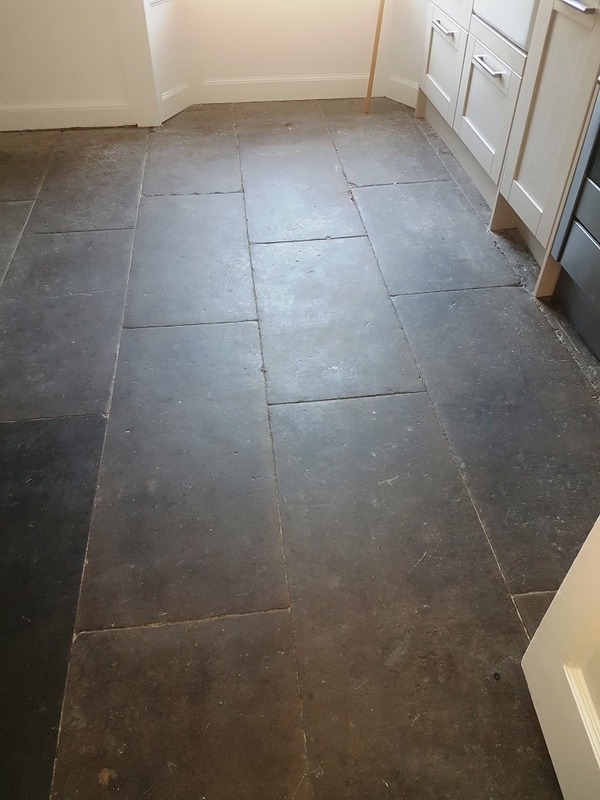 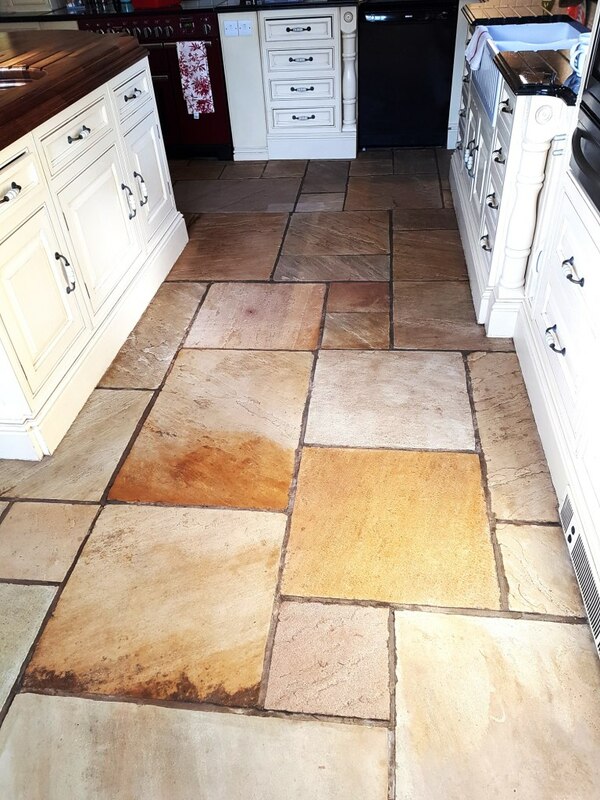 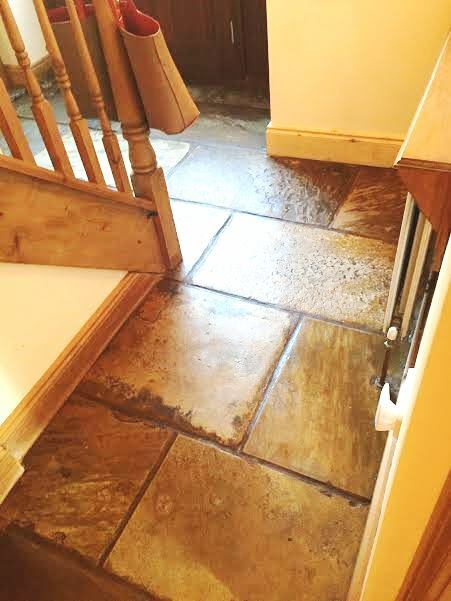 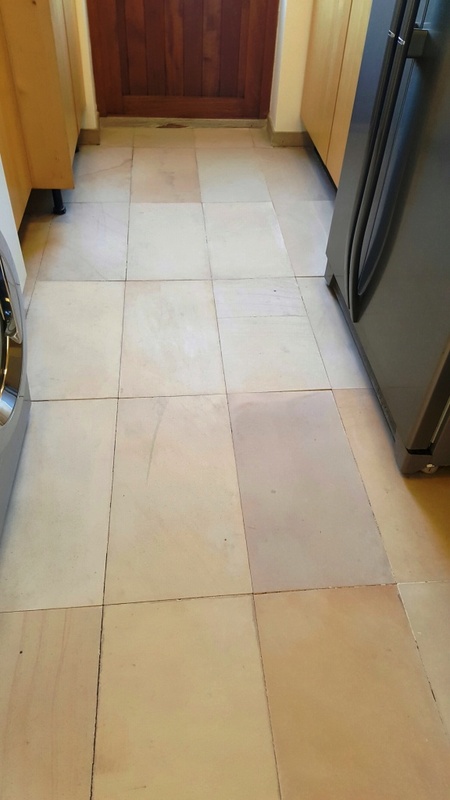 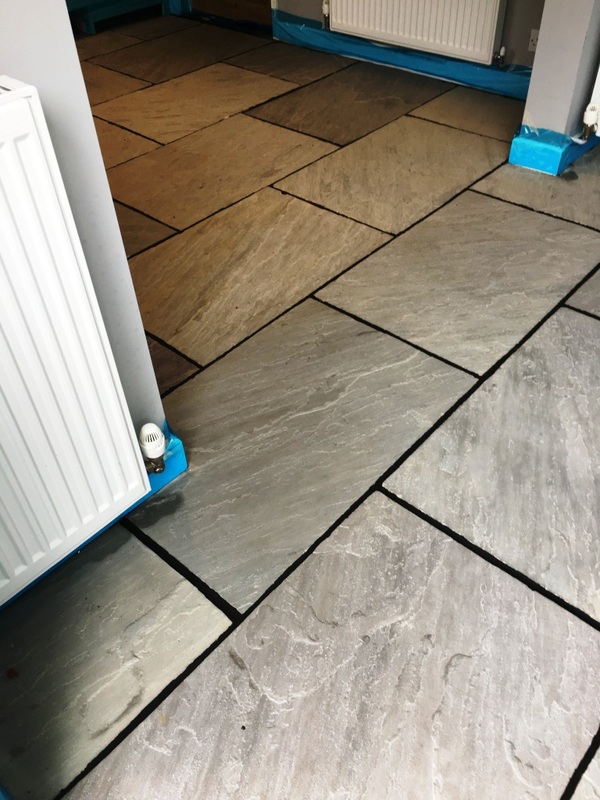 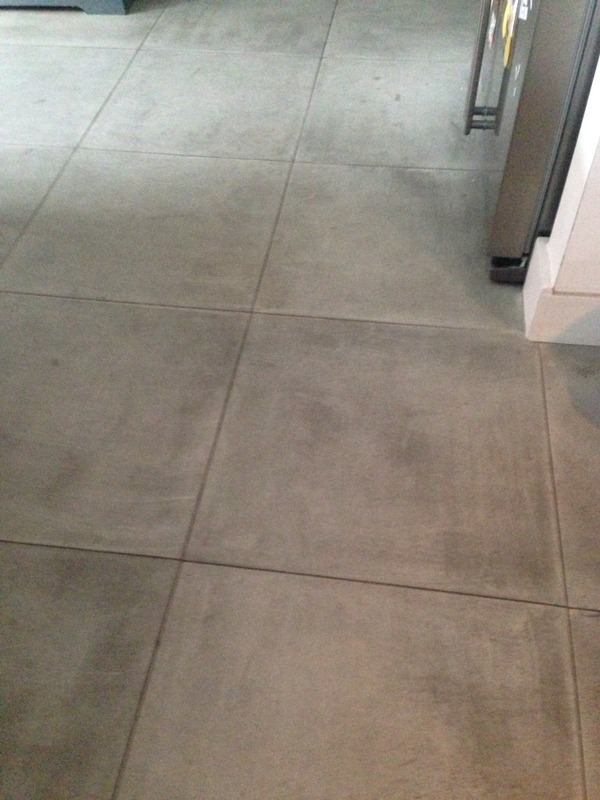 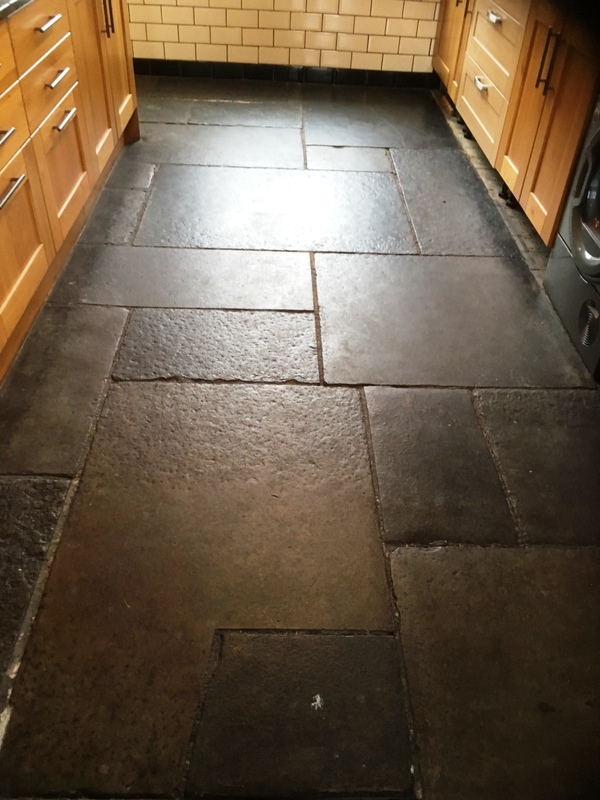 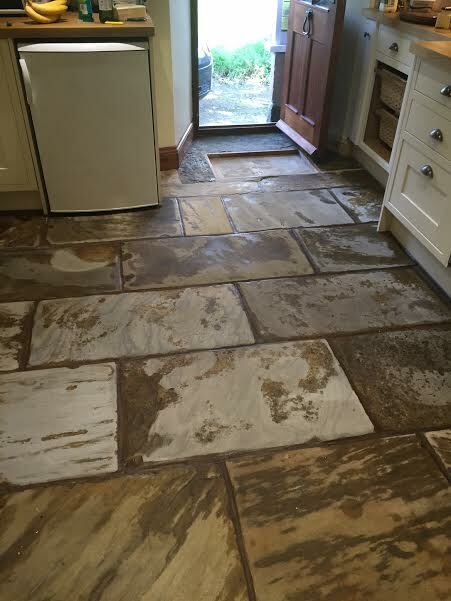 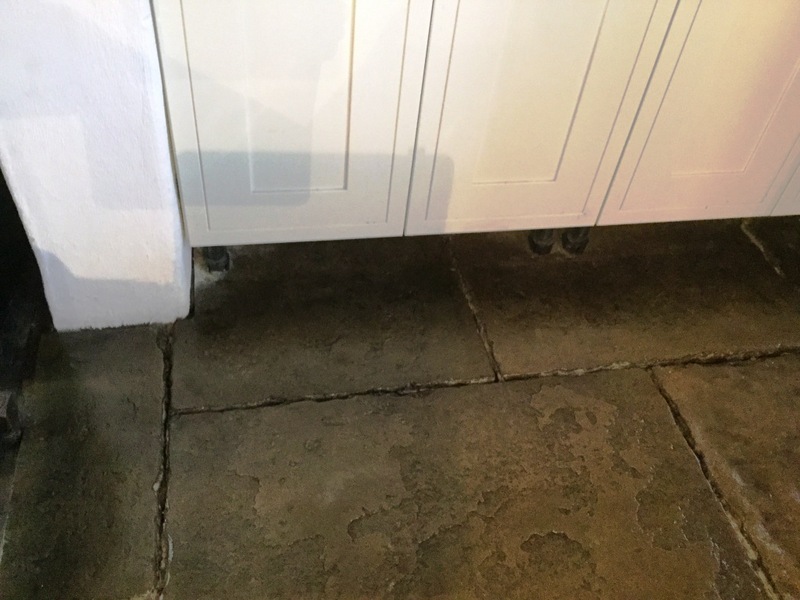 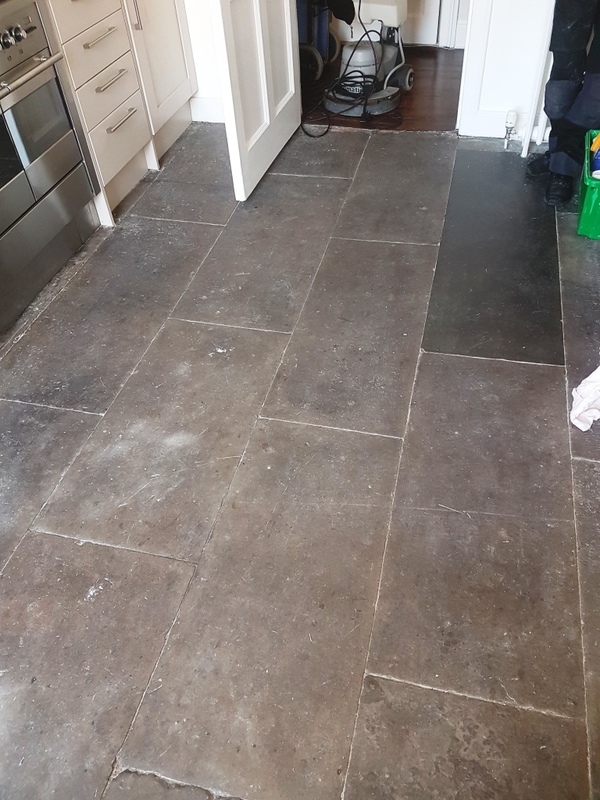 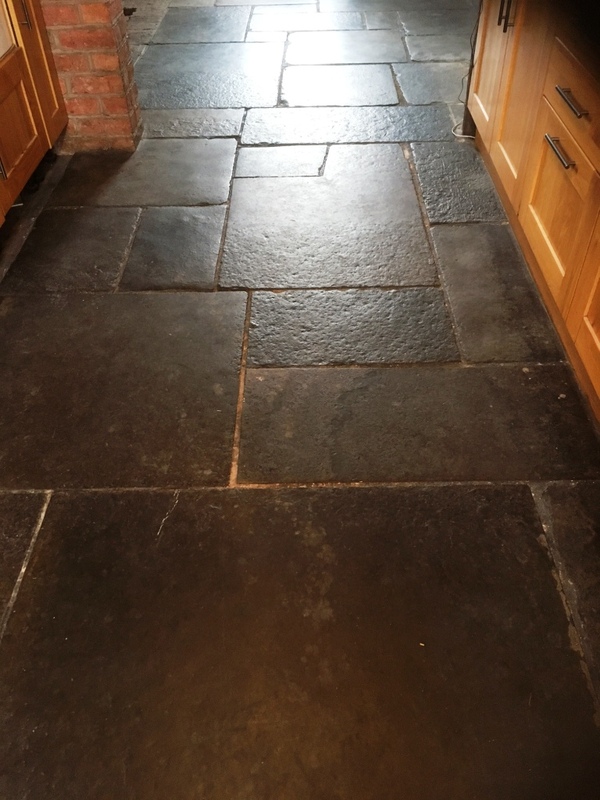 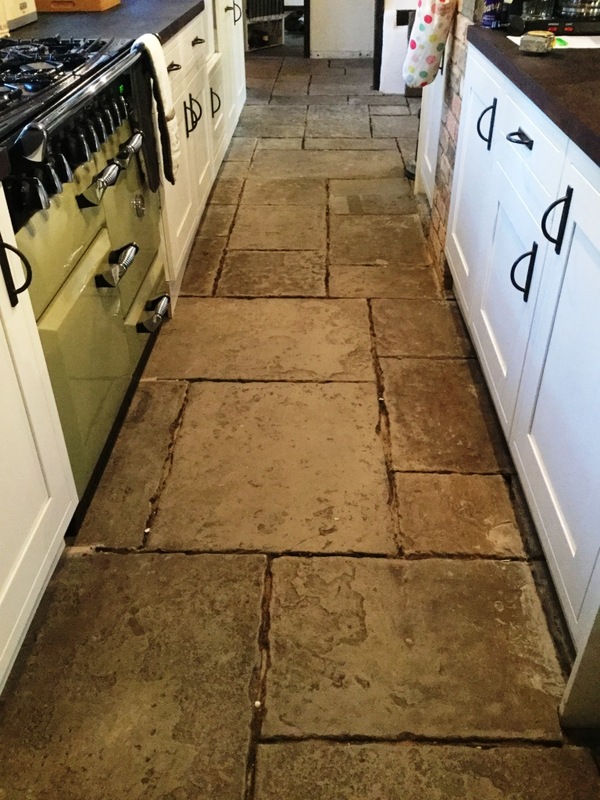 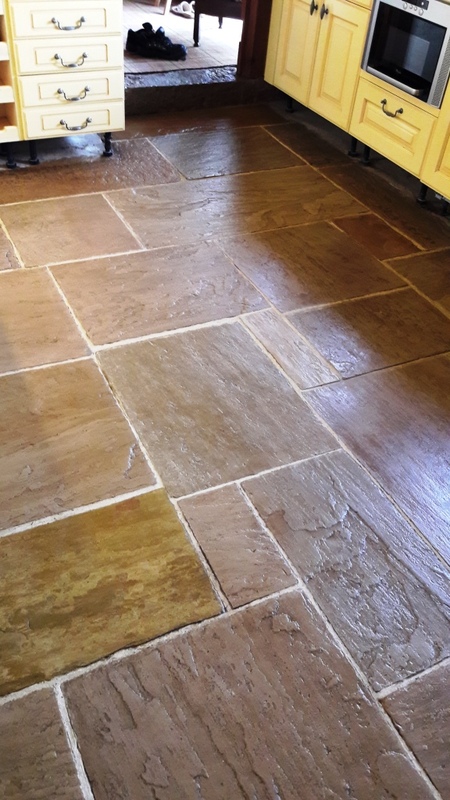 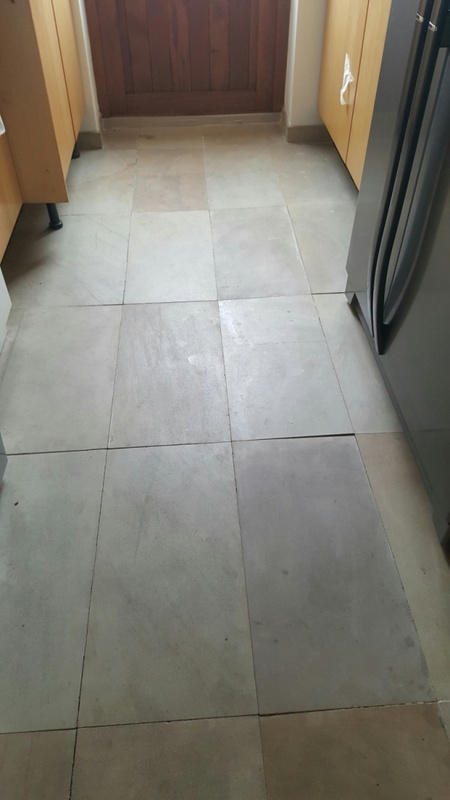 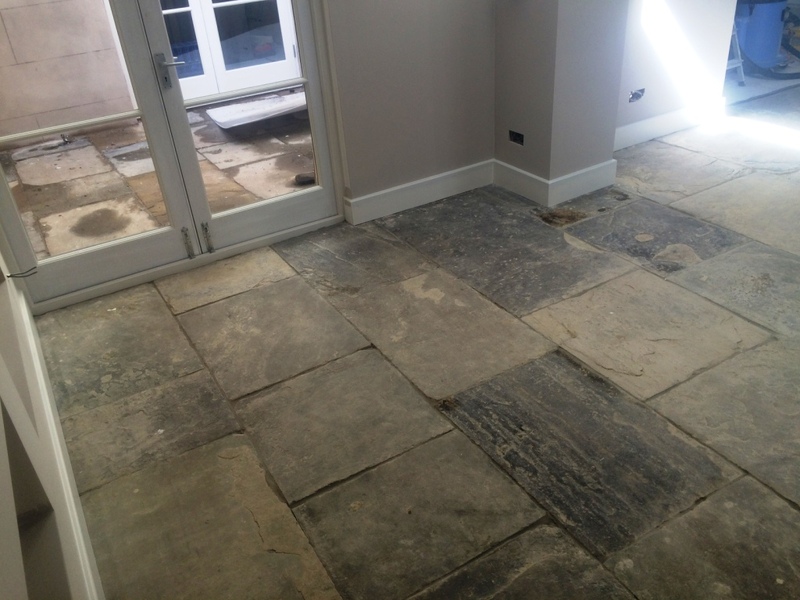 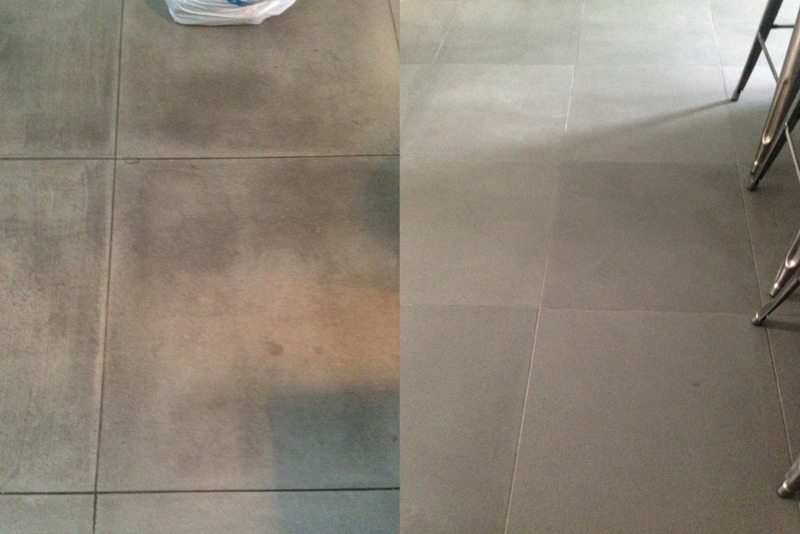 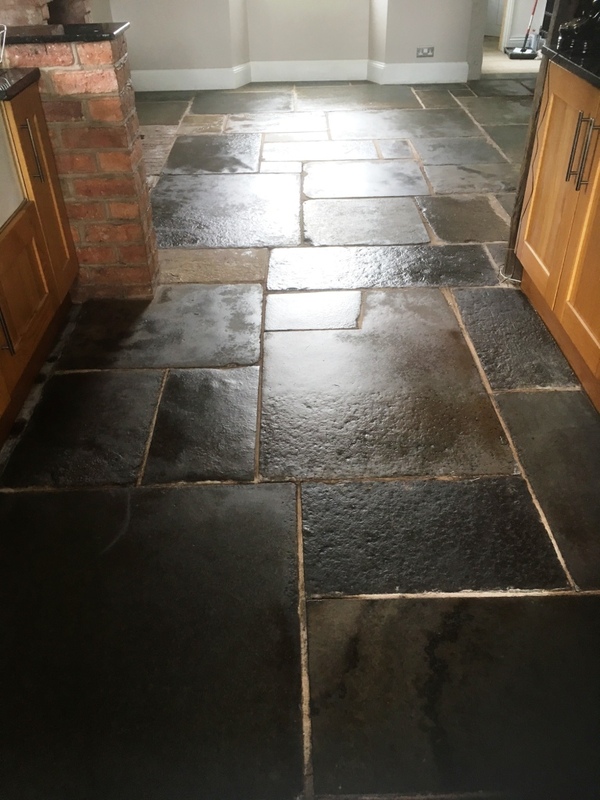 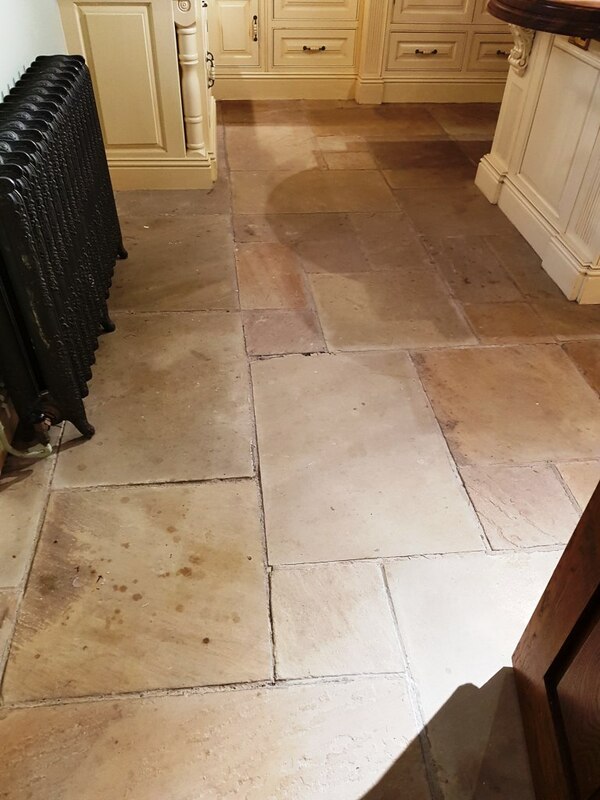 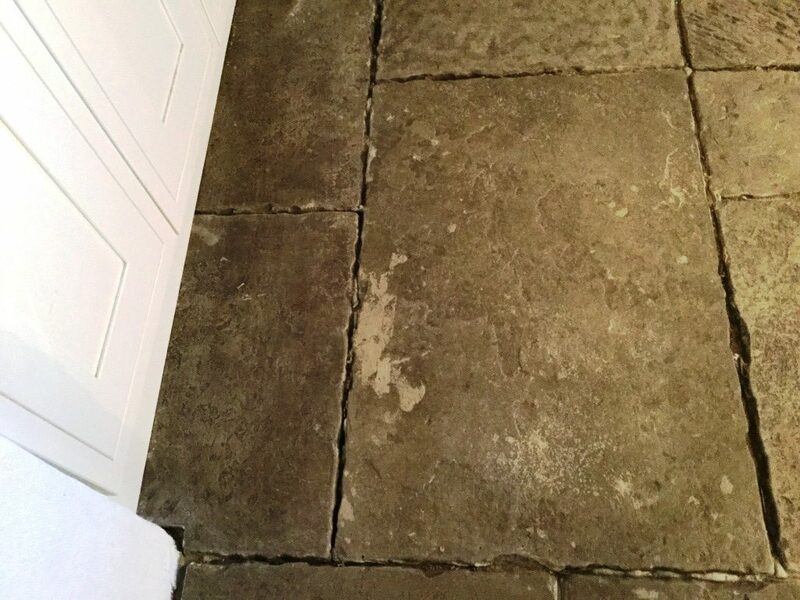 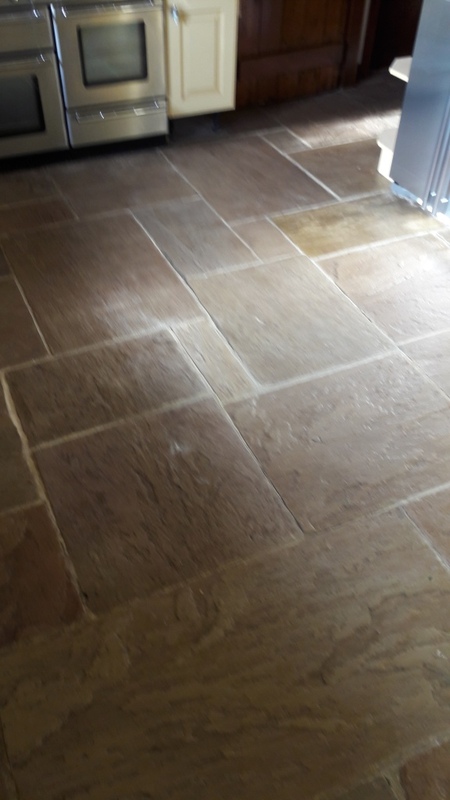 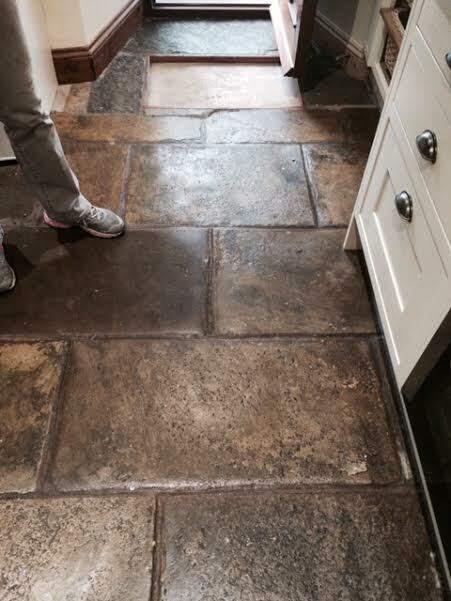 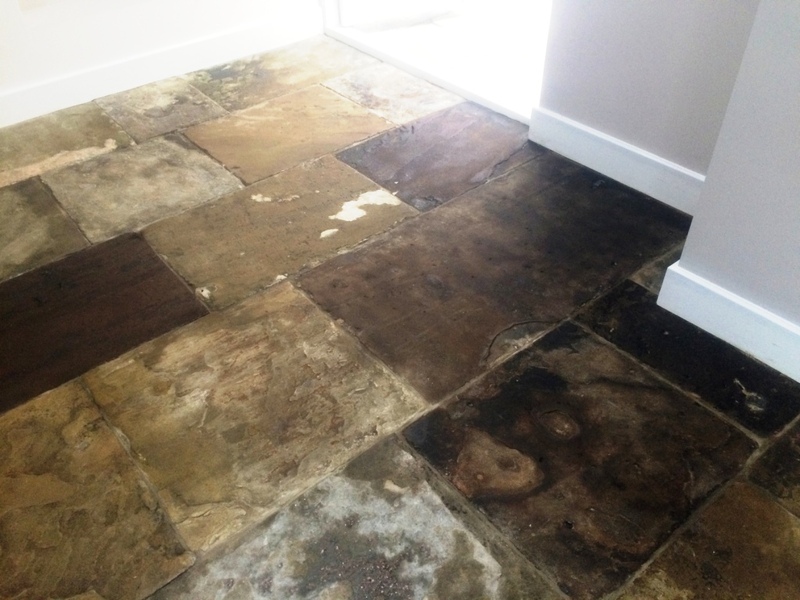 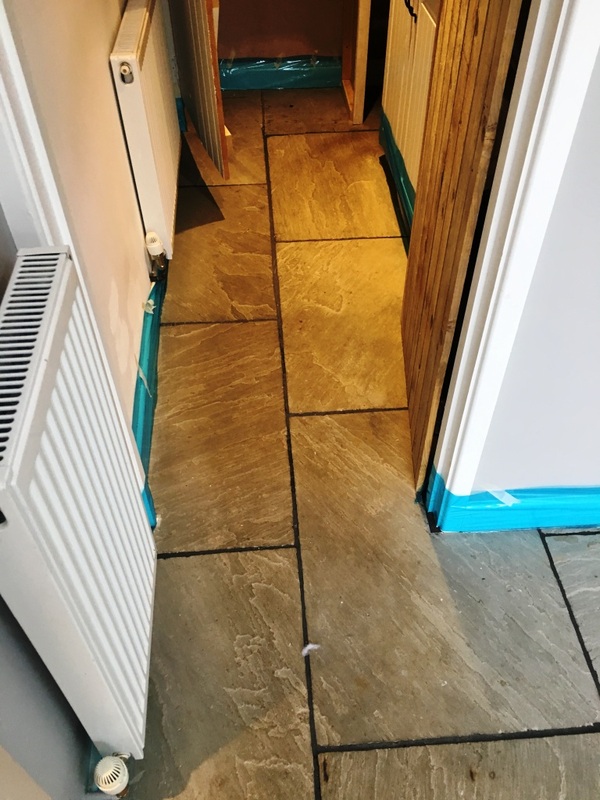 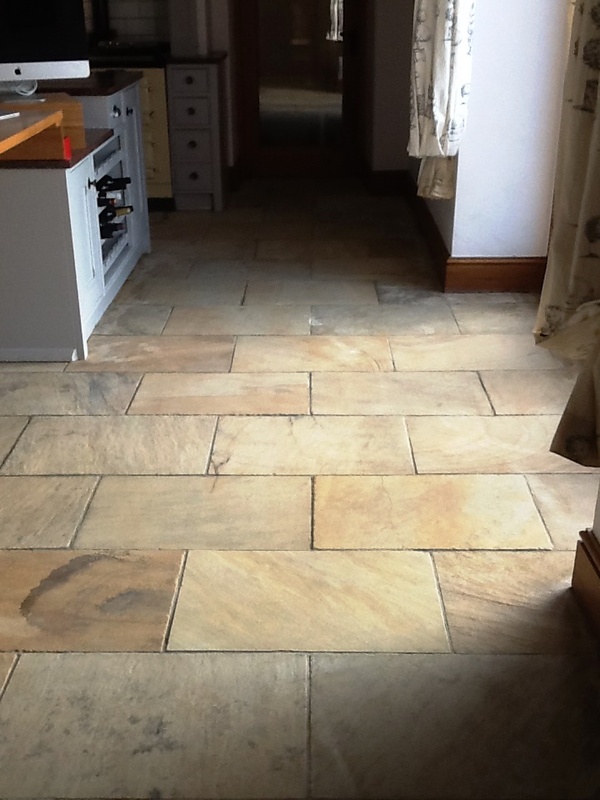 Although the Flagstone tiled floor in my client’s kitchen was – generally speaking – in good physical condition, the surface seal had worn down over time, leaving the tiles looking dull and lifeless. 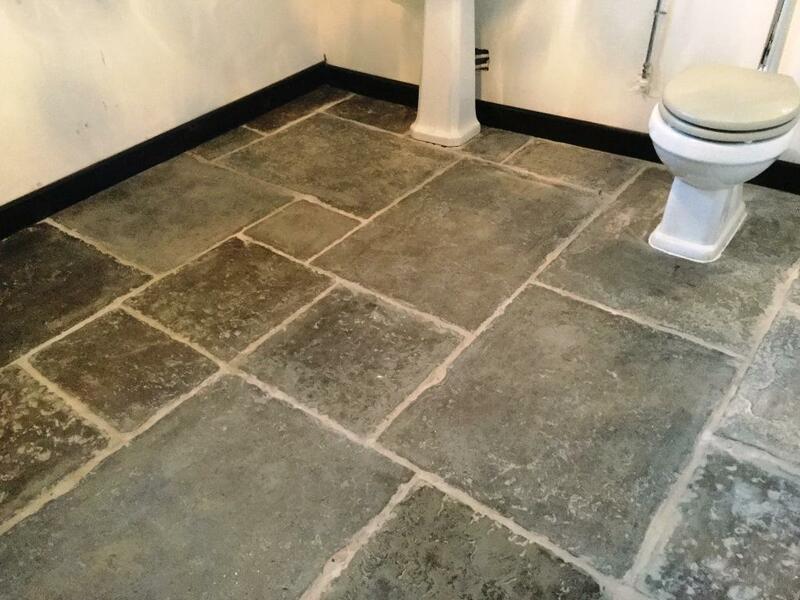 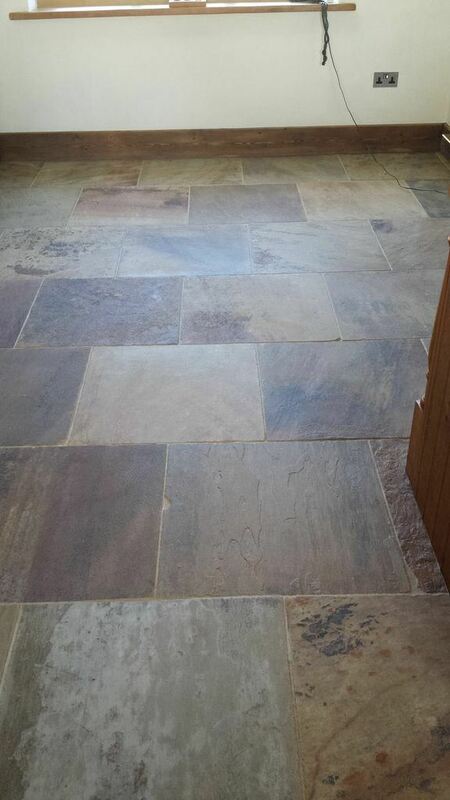 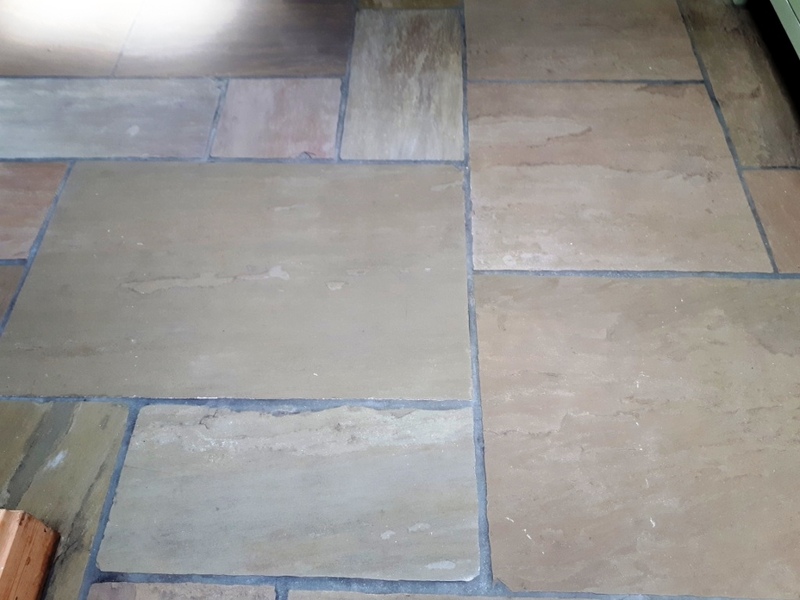 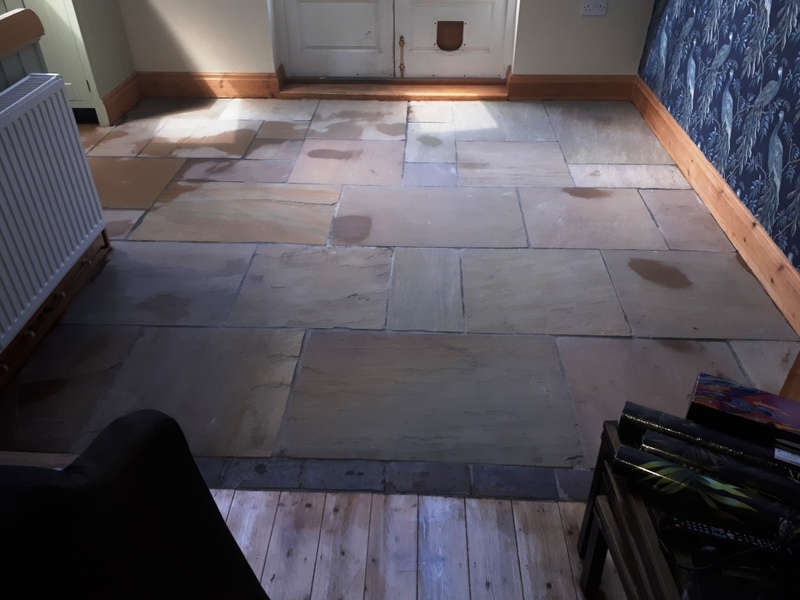 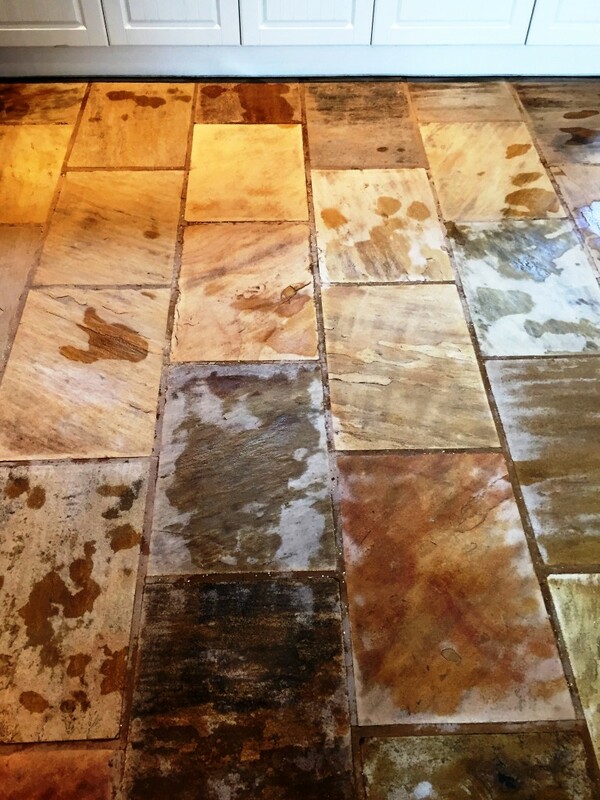 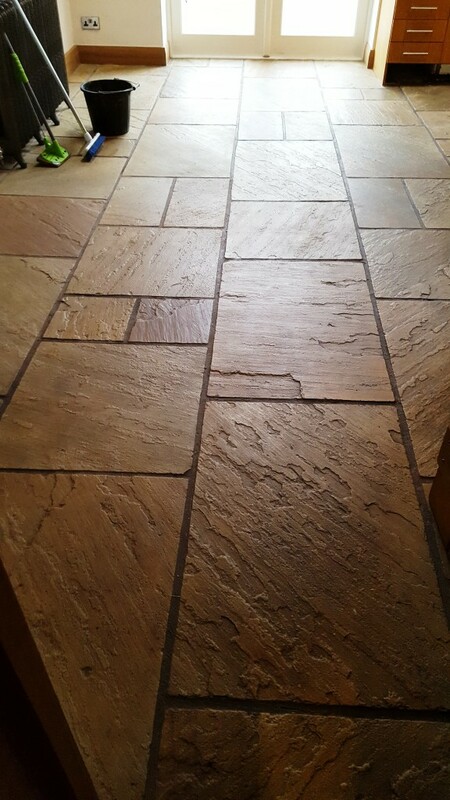 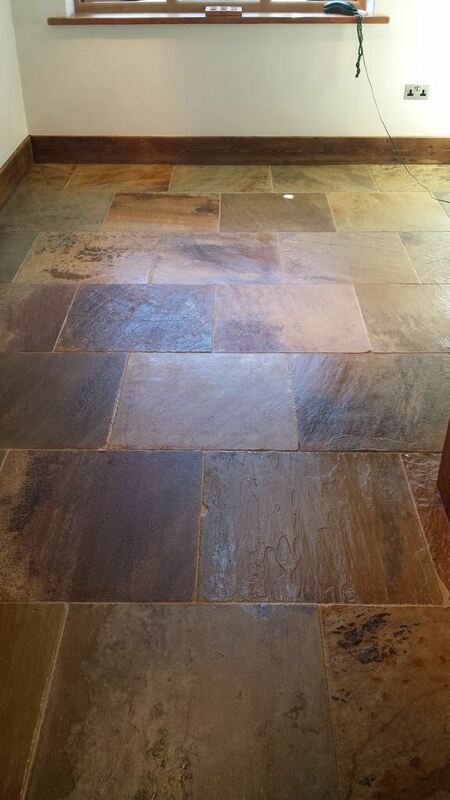 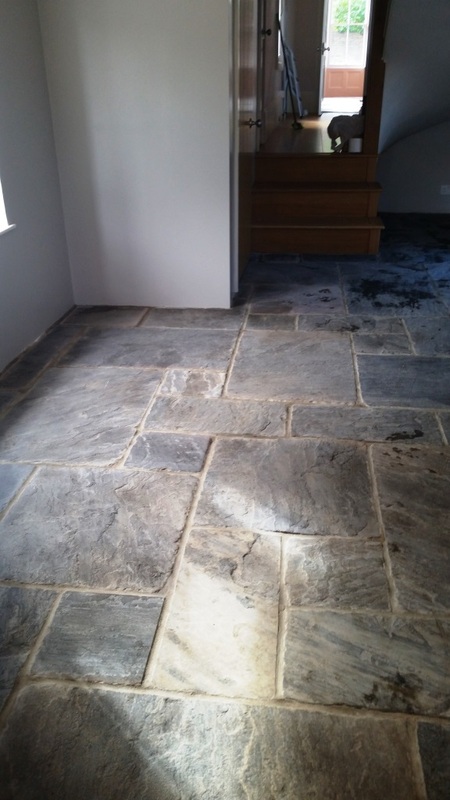 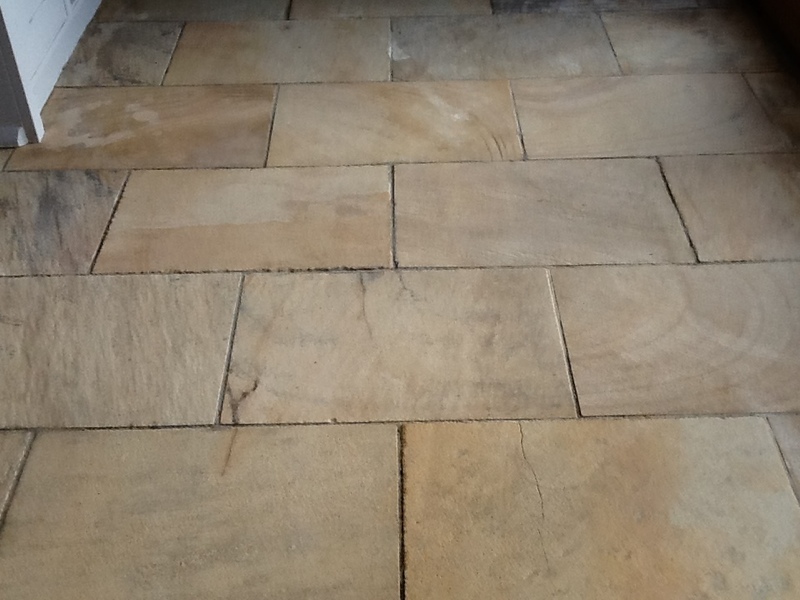 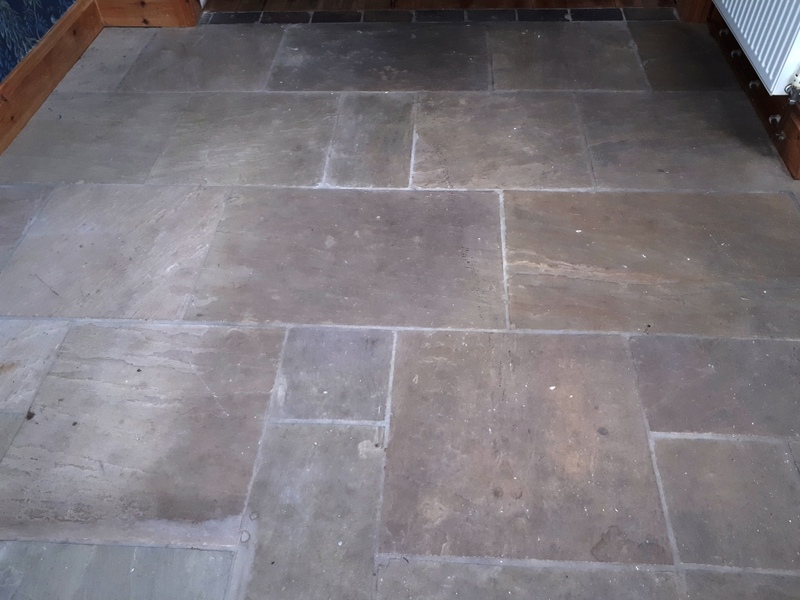 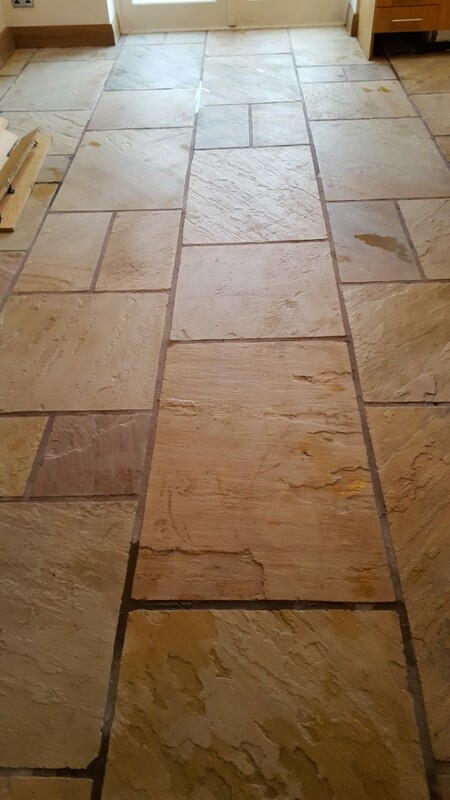 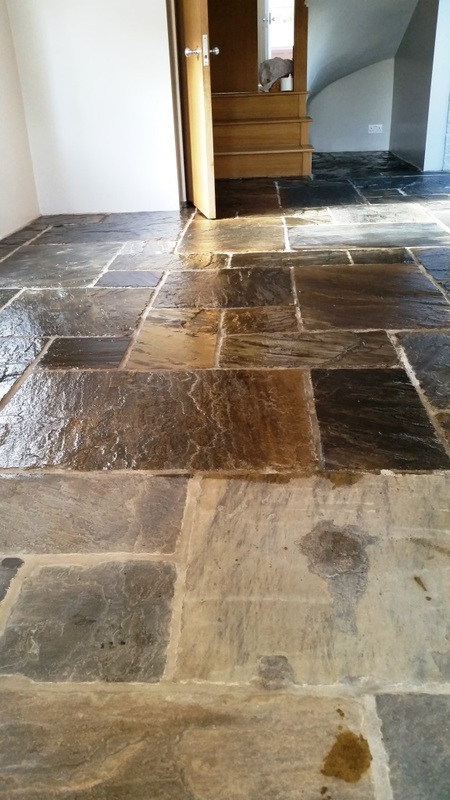 Flagstone is quite a hard wearing stone that is commonly used for both internal and external surfaces, whether this is something as simple as a kitchen floor, or something more complex like a public monument. 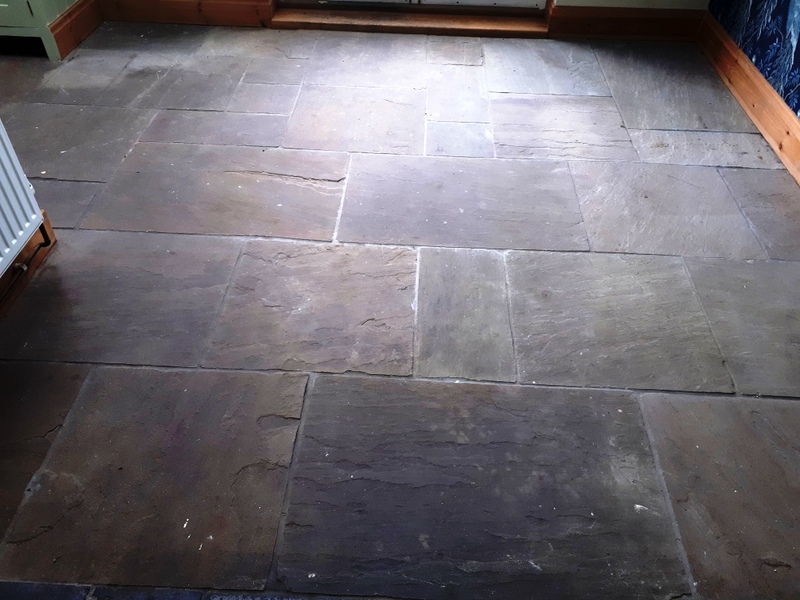 I was commissioned to restore the floor back to looking it best, by way of a thorough clean and a new seal. 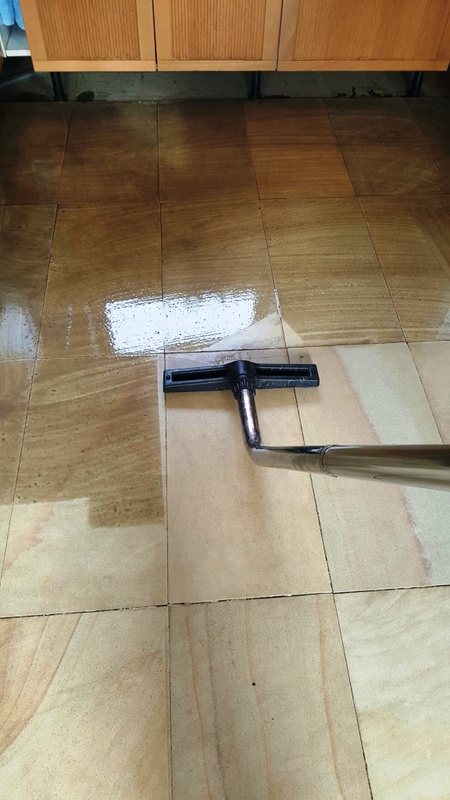 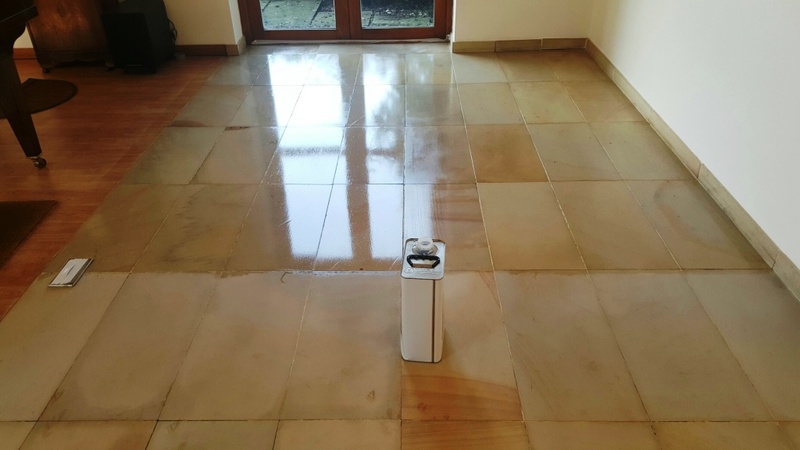 My go to cleaner for most kinds of natural stone tile is Tile Doctor Pro-Clean, a high alkaline product which contains both cleaning and stripping properties depending on the dilution ratio. 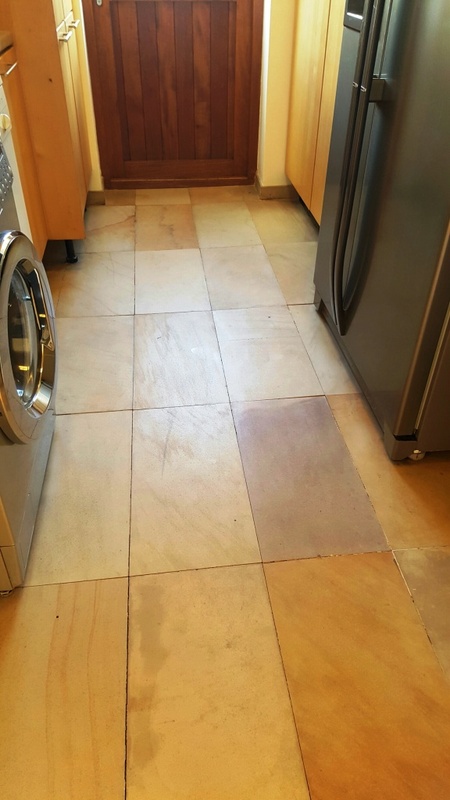 In this case I wanted a strong solution so I could strip off any remaining sealer and so it was diluted one part Pro-Clean to three parts clean water. 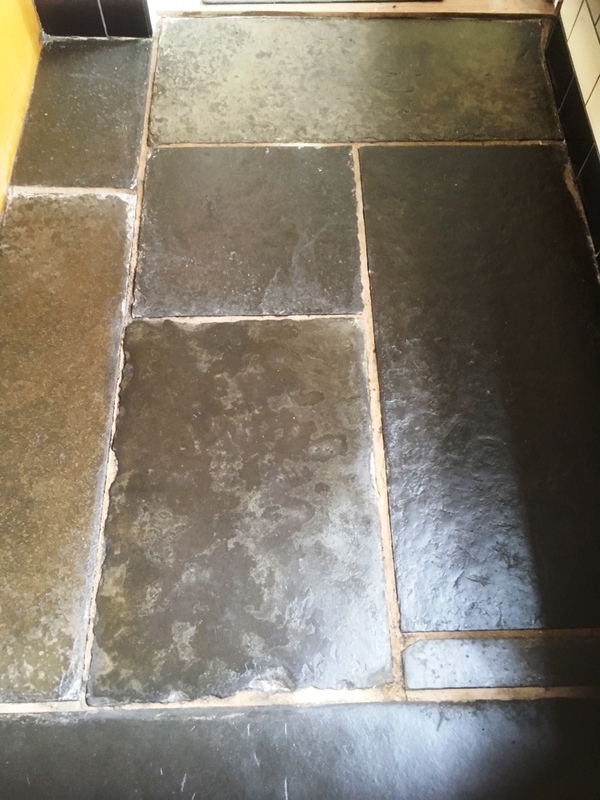 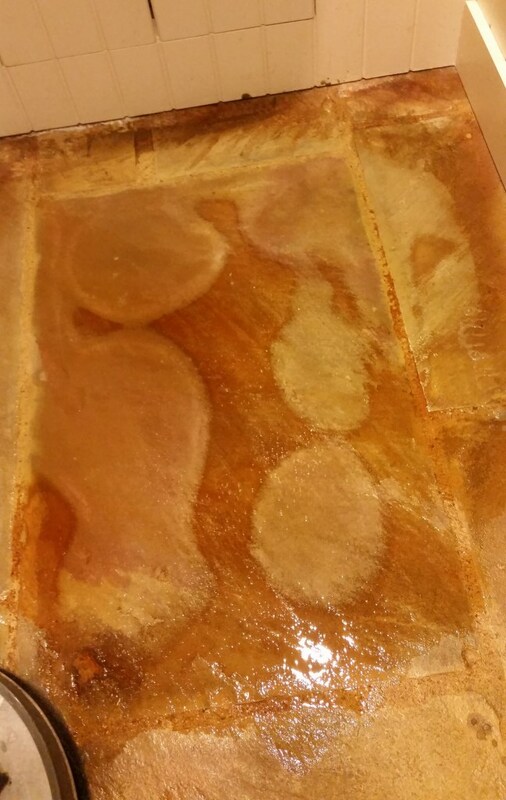 The solution was left to dwell for 10 minutes, allowing it to soak into the stone and get to work breaking down any remaining sealer. 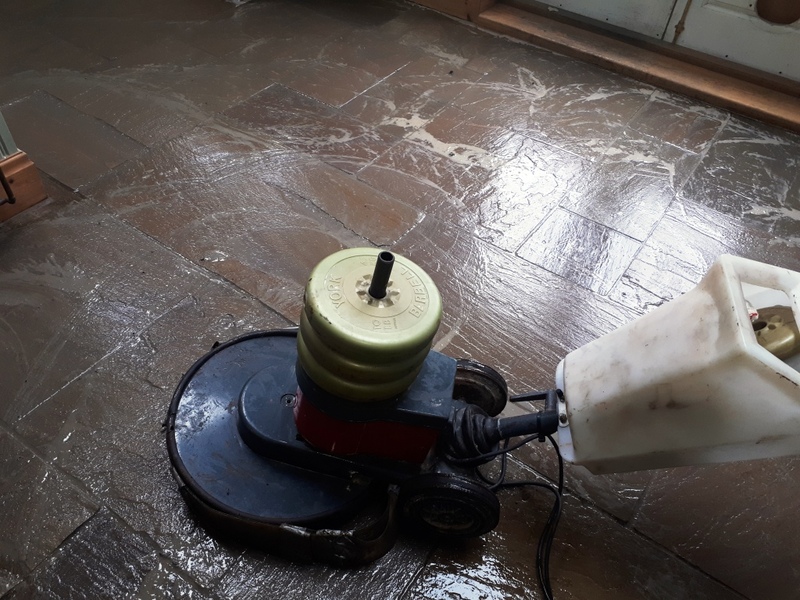 I then attached a black scrubbing pad to my rotary machine, and used this to agitate the solution into the tiles. 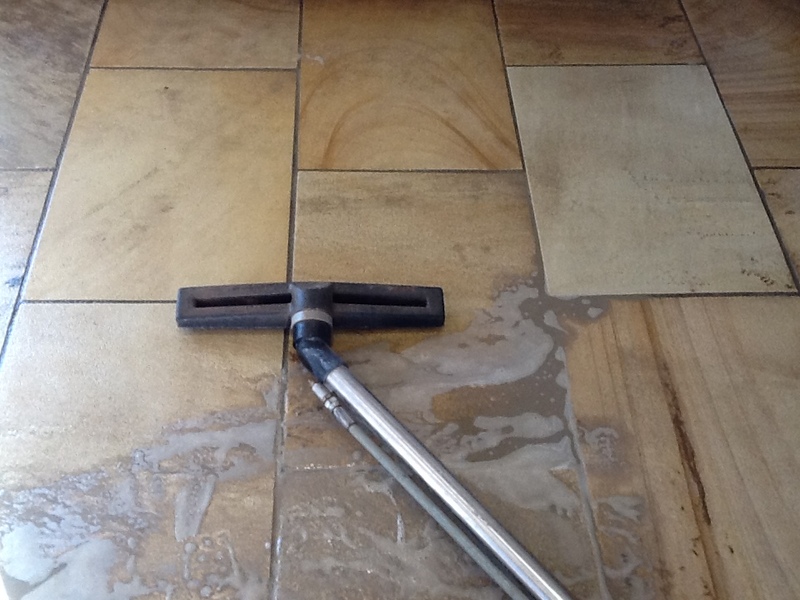 This helped to lift out any ingrained dirt and remove the stubborn marks blemishing the floor. 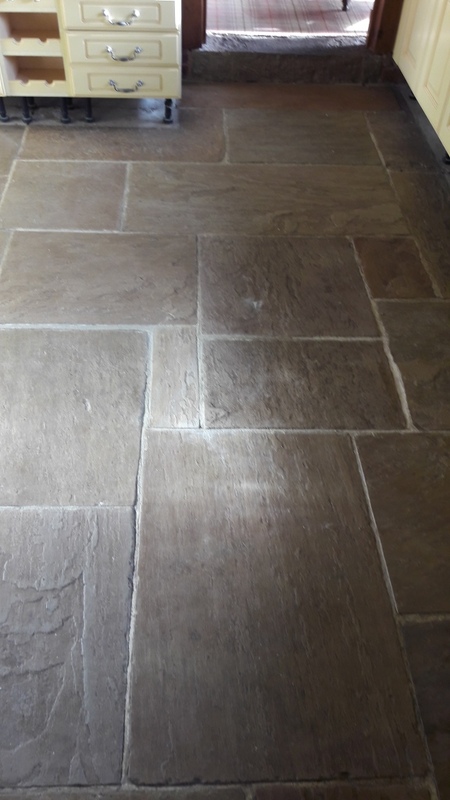 Once the initial clean had been completed, I turned my attention to the grout between the tiles, using Pro-Clean in combination with a stiff grout brush to clean up the grout as much as possible. 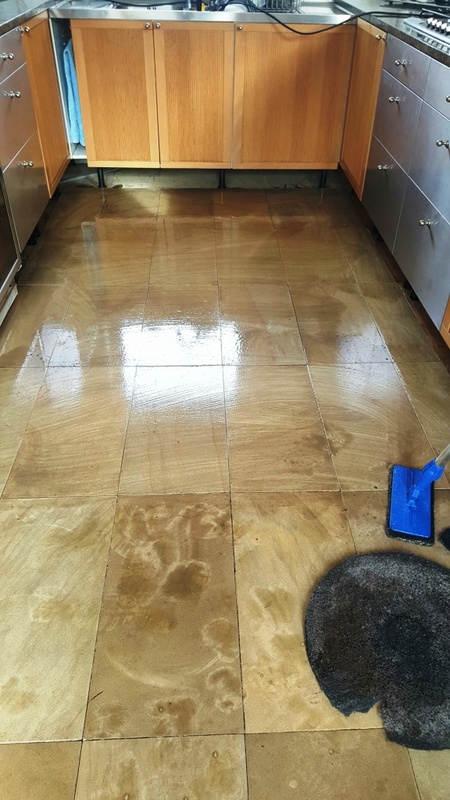 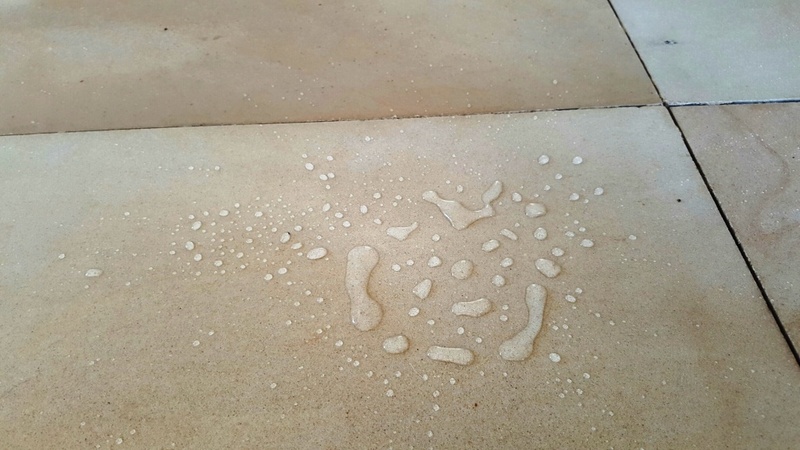 I cleaned the floor twice in total before rinsing the entire area with water and leaving the house for a few days, giving the surface time to dry. 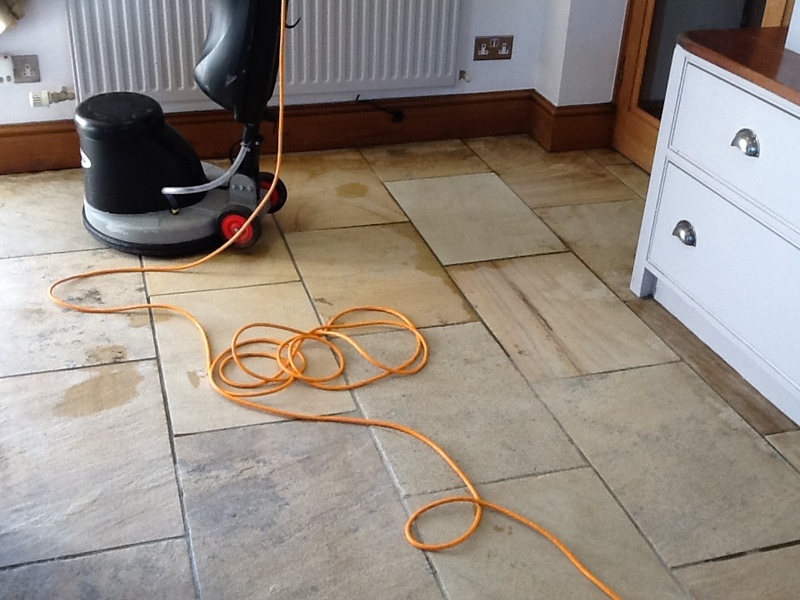 Upon my return to the house, I ran some damp tests to double check that the floor had dried completely. 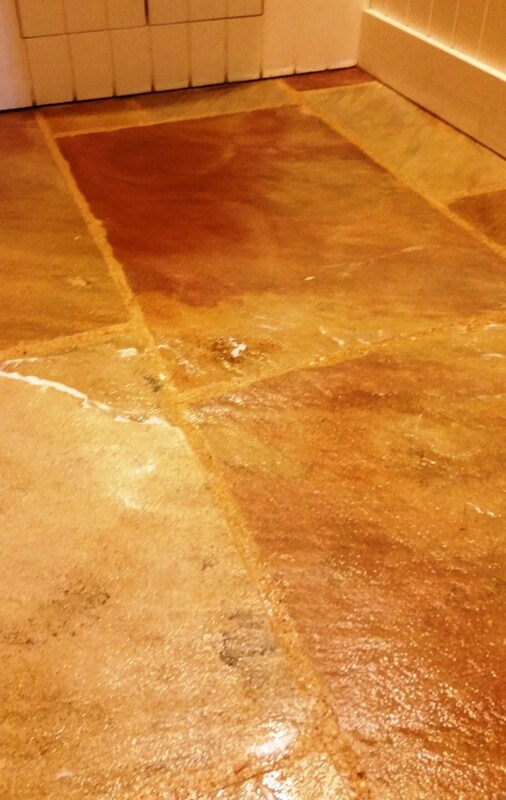 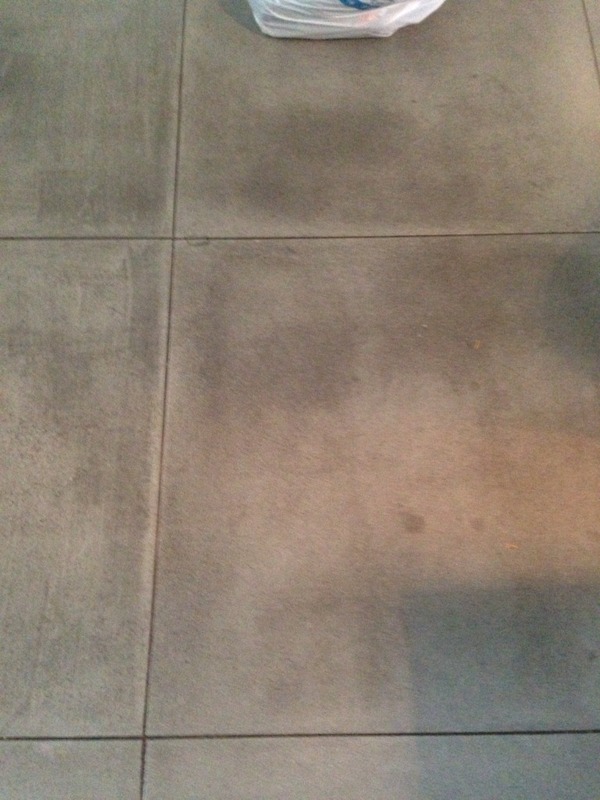 This is important as any residual moisture can potentially damage the performance of the sealer. 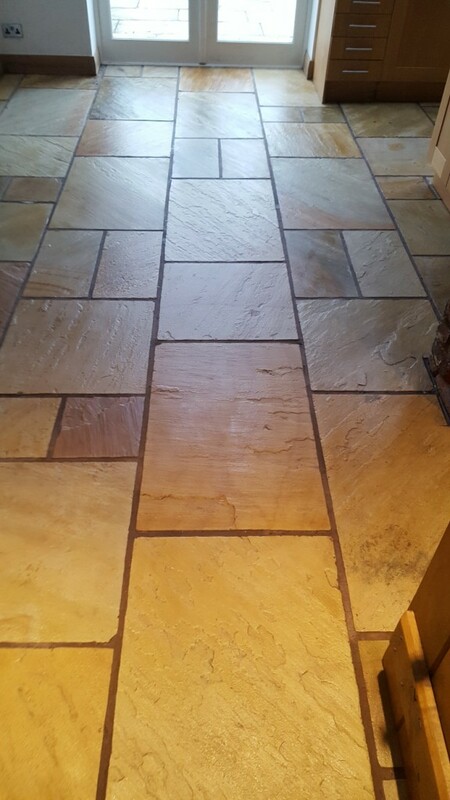 Once I was satisfied that the tiles were able to take the seal, I applied two coats of Tile Doctor Colour Grow sealant. 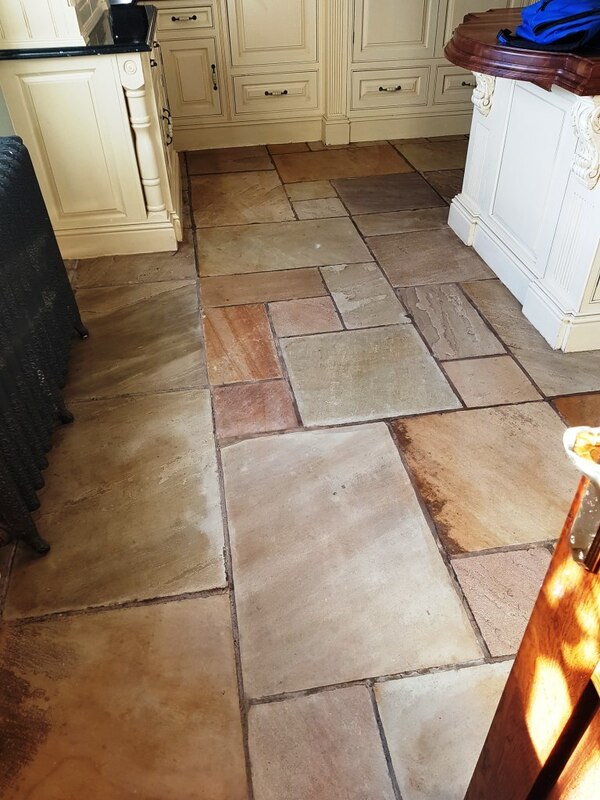 Colour Grow is an impregnating sealer that seeps into the pores of the stone provides durable stain protection from within, along with a nice finish. 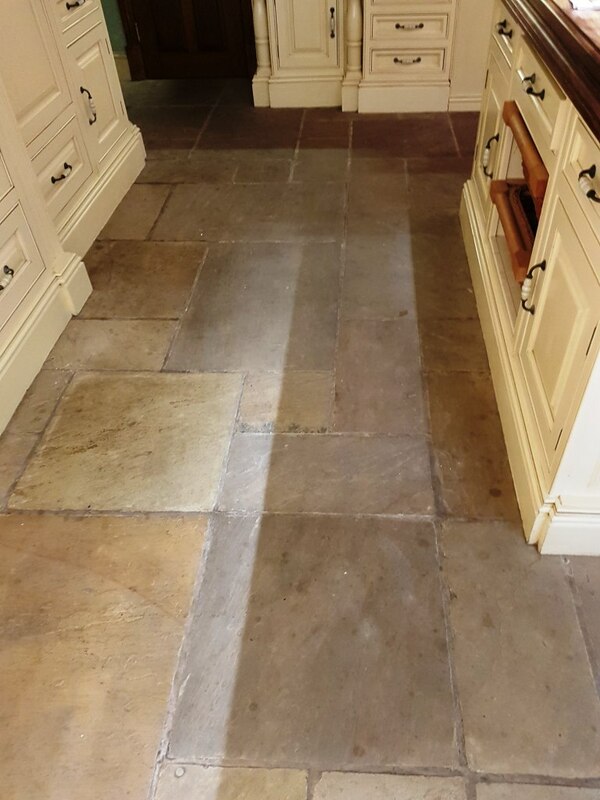 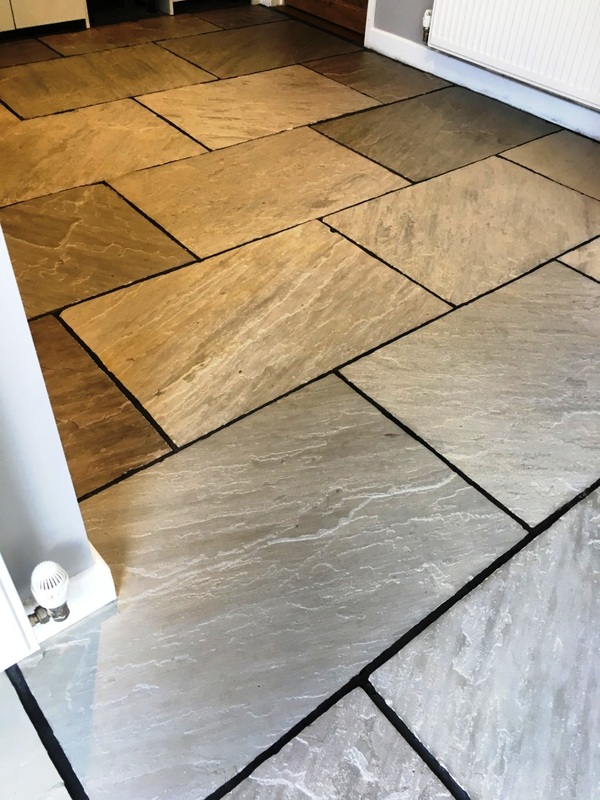 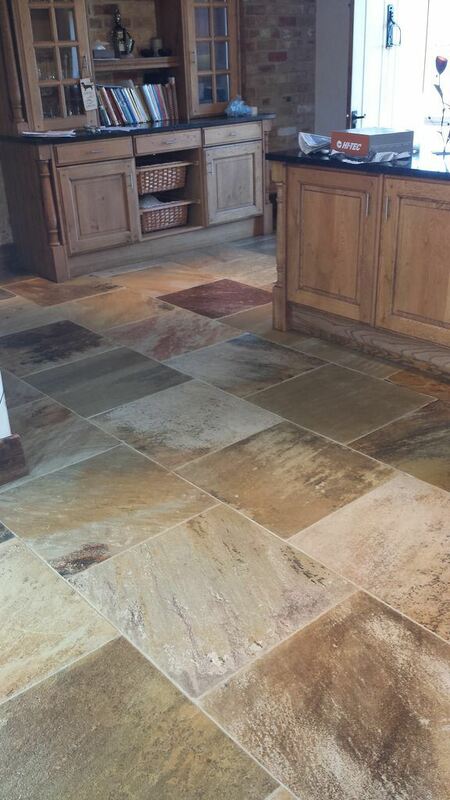 It’s also specially designed to intensify the natural shades and colours in the stone, turning dull floors into characterful household features. 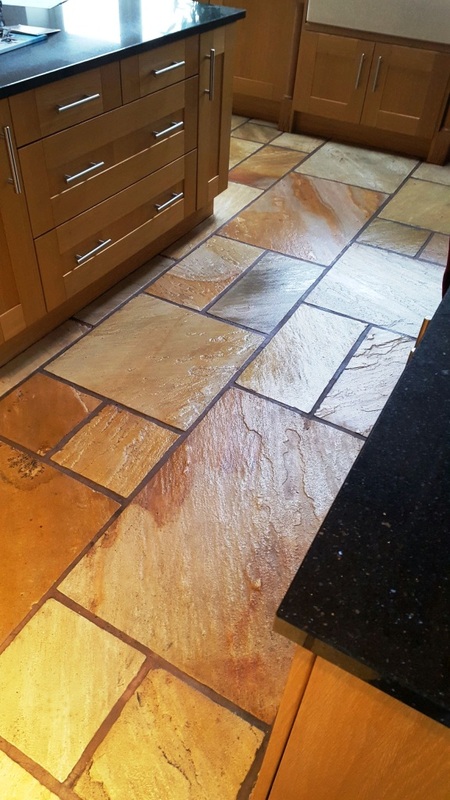 Colour Grow is suitable for use most stone surfaces, including Flagstone, Limestone, Marble, Quarry, Sandstone and Slate. 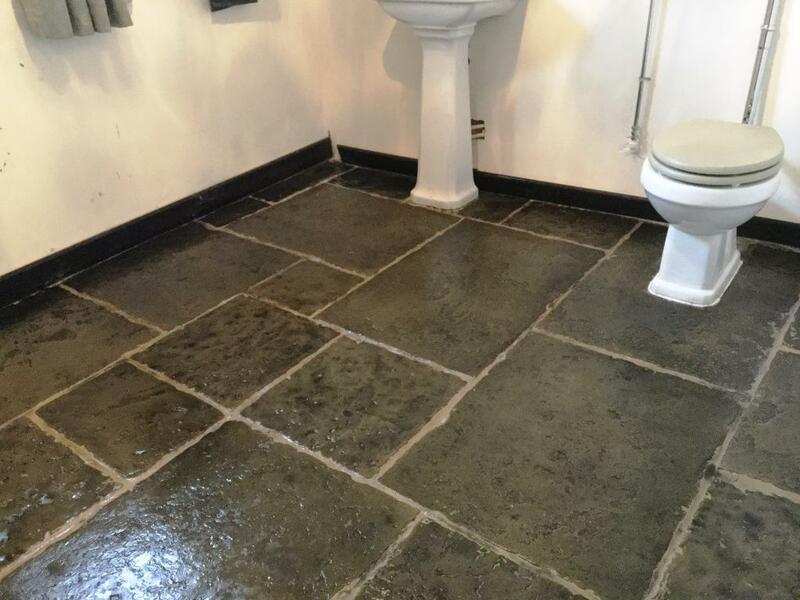 My customer was very pleased with the result, with marked differences in condition and appearance achieved in the space of a few short days.